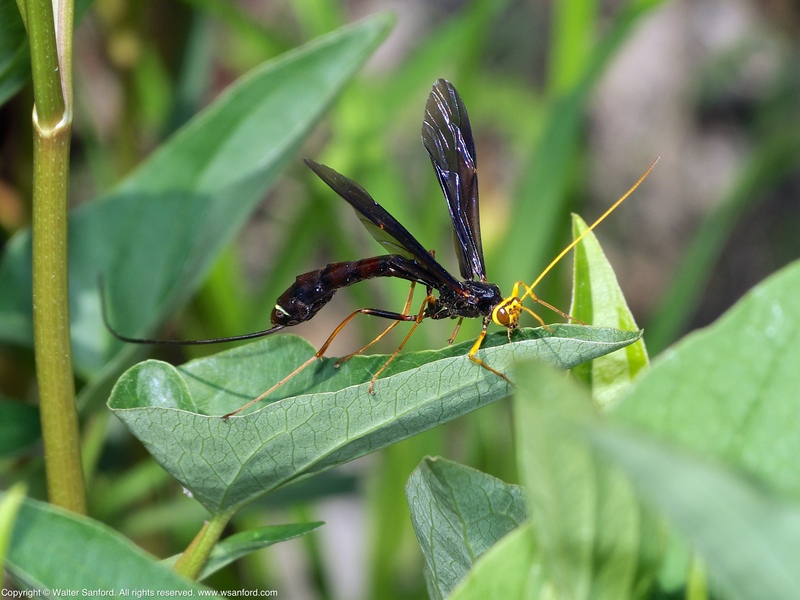 A Giant Ichneumon wasp (Megarhyssa atrata) was spotted during a photowalk along one of the informal trails at Huntley Meadows Park. 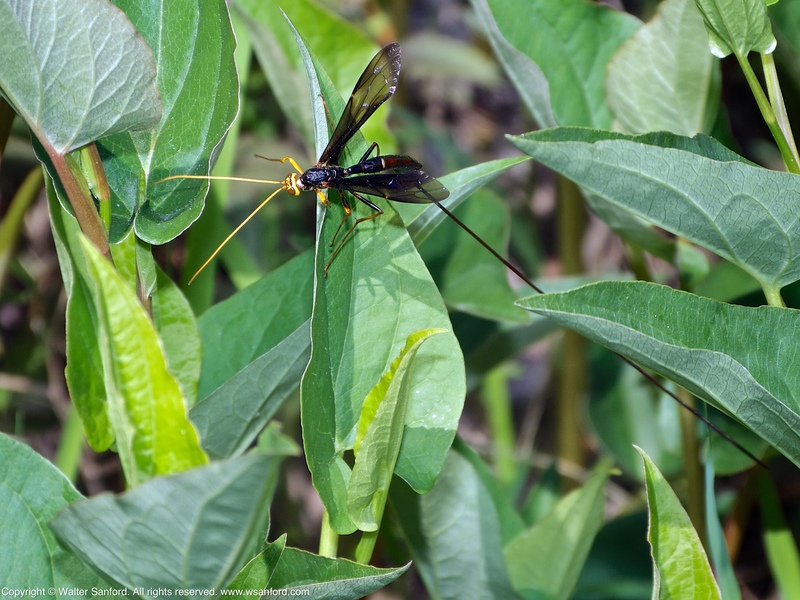 This individual is a female, as indicated by its long ovipositor. 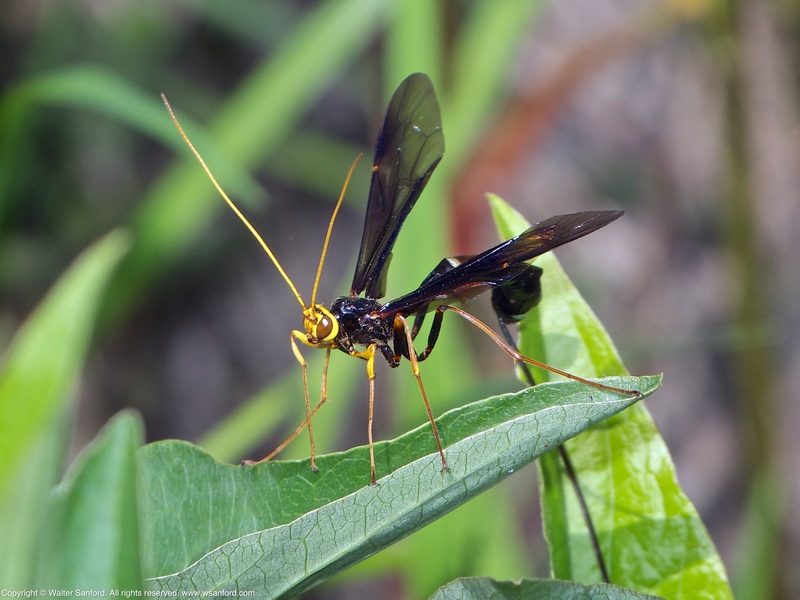 Parasitoid noun, plural parasitoids – an insect that, in the larval stage, feeds off of the tissues of its host (as does a parasite), but this feeding normally results in death of the host. Thus a parasitoid is in some ways a predator as well. Source Credit: Parasitoid, BugGuide Glossary. Once upon a time I was a photography purist: Every photograph I shot was taken in natural light. Then one day I had an epiphany: Fill flash brings out detail and enhances color, contrast, and sharpness. In a word, flash good! I remember the day of my conversion from the dark side vividly. I was trying to photograph a Blue Corporal dragonfly (Ladona deplanata) during Spring 2013: Male Blue Corporals are dark blue and the subject was backlighted by the Sun; all of the photos I shot appeared to be underexposed and showed almost no detail. I decided to try using the built-in pop-up flash on my camera, and boom, the results were much better! For the rest of the year, I used the pop-up flash full-time. 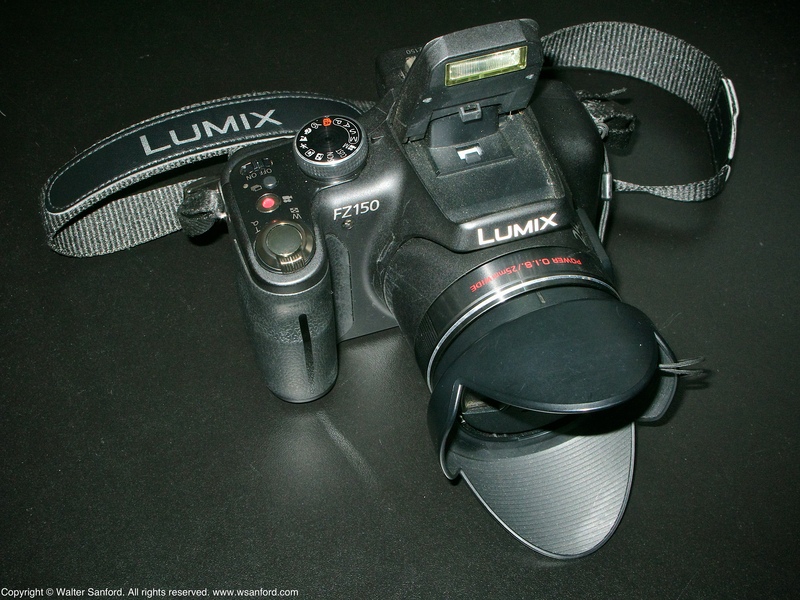 My love of flash photography began with the built-in pop-up flash on my Panasonic Lumix DMC-FZ150 superzoom camera. Eventually I came to realize the obvious: The pop-up flash is better than nothing but it’s underpowered in many (if not most) situations. Panasonic Lumix DMC-FZ150 pop-up flash. Mid-way through 2014, I started experimenting with using external flash units for Canon digital cameras mounted on my Panasonic camera. Both Canon flashes are virtually identical and are compatible with every digital camera I own, including the Panasonic Lumix DMC-FZ150, although the flashes must be used in manual mode. Both Canon flashes work with my Panasonic Lumix DMC-FZ150 at any shutter speed. This is huge, especially since I prefer to shoot in shutter priority mode at faster shutter speeds. Manual flash isn’t as hard to understand as I was led to believe. The following camera/flash settings are my usual starting point. Camera: ISO 100; Shutter Priority mode at 1/800s. Flash: Manual Mode; 1/16 power ratio; 105mm zoom. I own several external flash units for my Fujifilm X-T1 digital camera. The last photo shows a few of my favorite accessories for external flash photography. 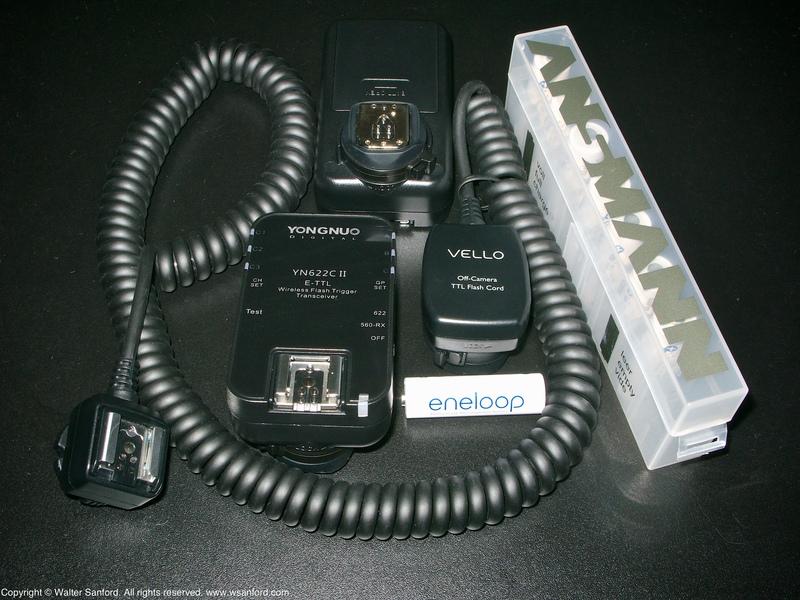 Accessories for external flash units. One of my goals for 2016 is to experiment with on-camera versus off-camera flash using some of the accessories shown above. The following photos were taken on 21 December 2015 at Huntley Meadows Park while field-testing a new Nissin i40 external flash unit with my Fujifilm X-T1 mirrorless digital camera and 55-200mm zoom lens (88-320mm, 35mm equivalent). 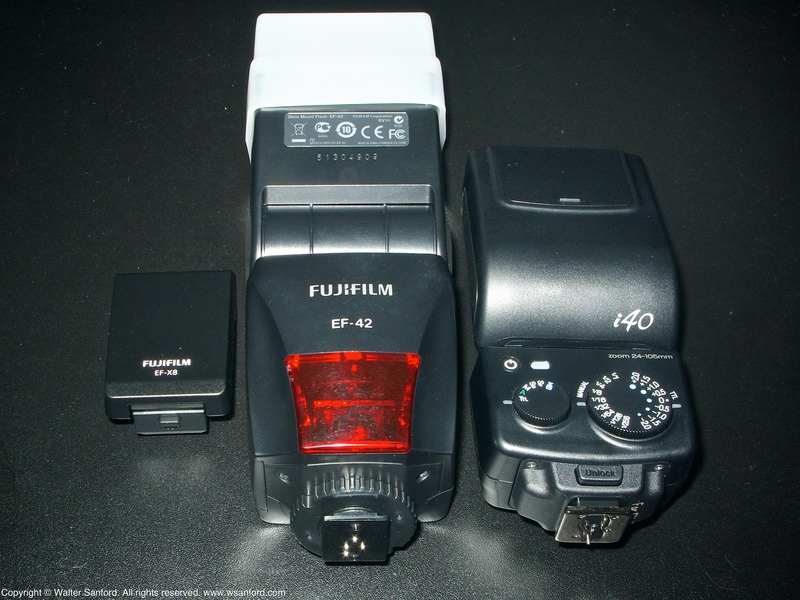 The camera was set for “Forced Flash”: “Flash On, Fired” appears in the EXIF information for all shots. The camera was set for Manual Mode: both Aperture and Shutter Speed were operator-selected; ISO was set to “Auto.” Notice the camera used ISO 800 for every shot. One obvious advantage of using a digital camera featuring a larger sensor — in this case, an APS-C sensor — is the camera can shoot relatively noise-free photos at higher ISOs. Also notice the rich color in each photo, something for which the Fujifilm X-series of cameras is well-known. 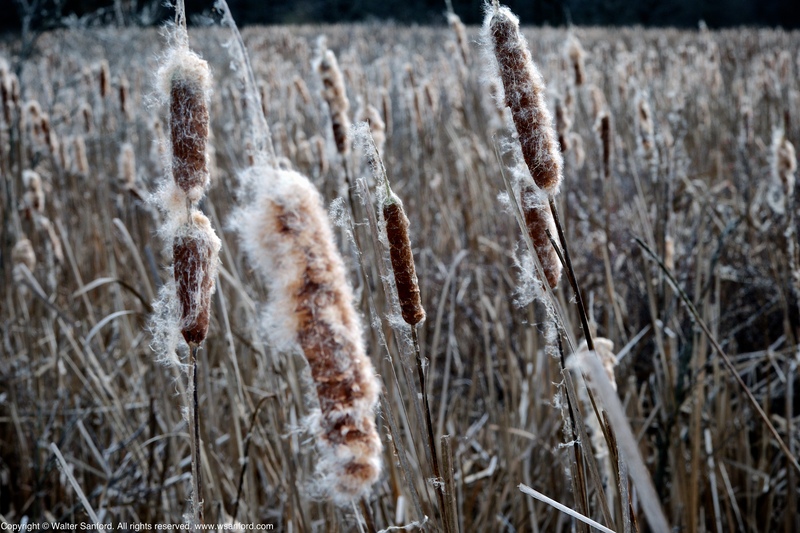 Cattails (Typha sp.) gone to seed. 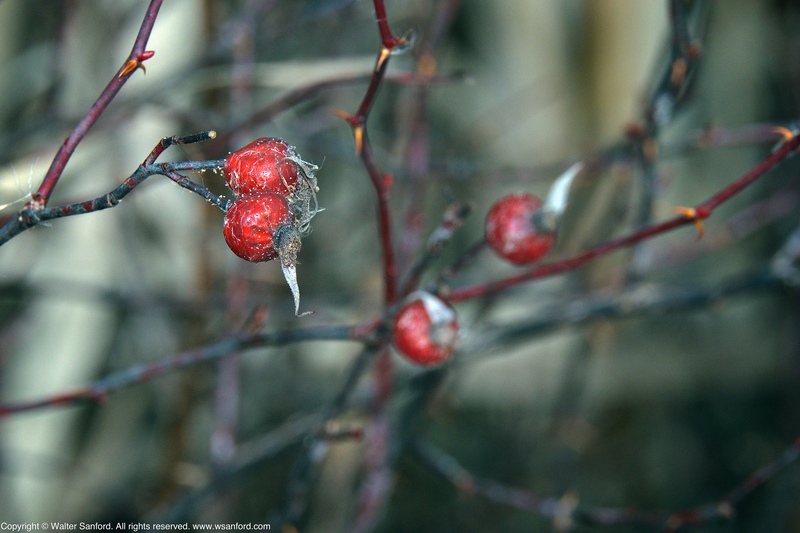 Swamp Rose (Rosa palustris) hips. 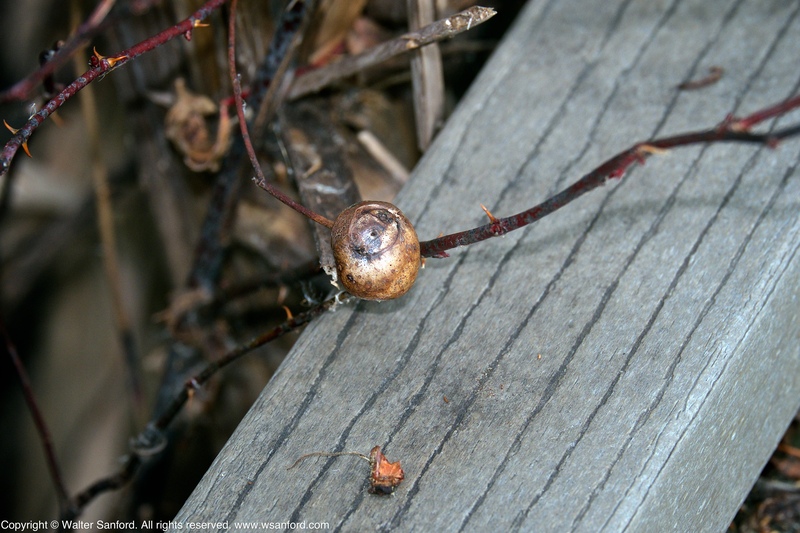 An insect gall on Swamp Rose (Rosa palustris). 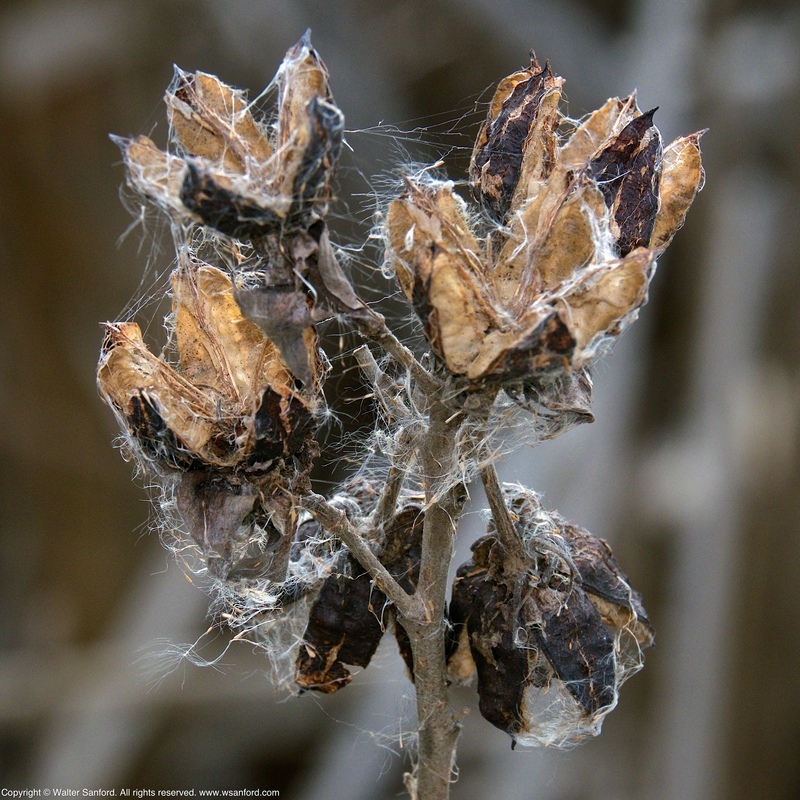 This gall was made by parasitic gall wasps (Diplolepis sp.). 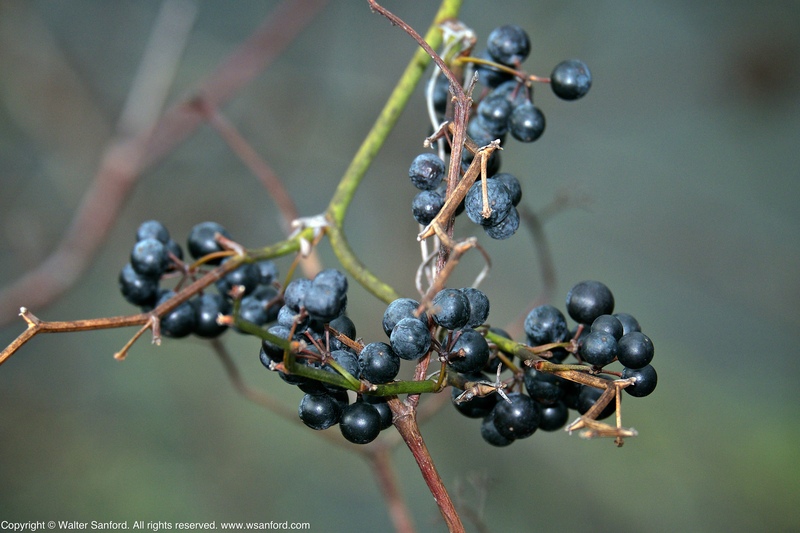 Unknown blue-black berries. Alonso Abugattas, moderator of the “Capital Naturalist” Facebook group, speculates this is probably a species of greenbrier (Smilax sp.). Unknown seed pods, probably Crimsoneyed Rosemallow (Hibiscus moscheutos). 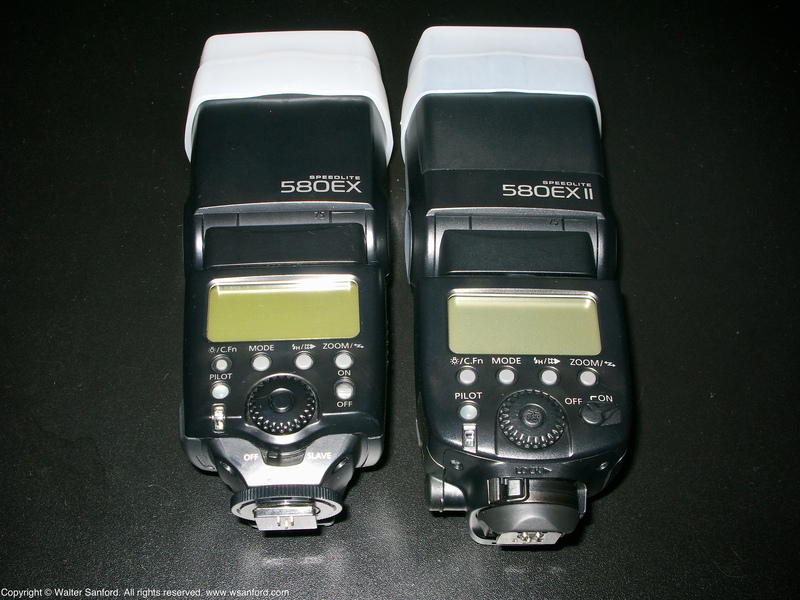 Related Resource: New tools for flash photography. In Where’s Waldo? — the last post in my photoblog — readers were challenged to guess the location in Huntley Meadows Park where the following photograph was taken. After shooting the preceding photograph, I used the Apple “Compass” app (free) for iPhone to determine my exact location. Tech Tip: Capture an image of the iPhone screen by pressing the “Home” and “Power” buttons simultaneously. Next, open Google Maps in a Web browser; click on the button labeled “Earth” (lower-left corner of window). Enter the following text string (refer to the “Compass” app screen capture, shown above) in the field labeled “Search Google Maps”: 38 45 8 N 77 6 44 W. Press the “return” key; the following satellite image/map should appear. Pretty cool, huh? Well, now you know my exact location when I photographed the “Mystery Pool.” Notice the “Compass” app also shows I was facing south-southwest when the photo was taken. In other words, I was standing where the red pin appears on the map, facing toward the bottom, a little left of center (relative to the map). Tech Tip: Some of my fellow WordPress bloggers may be wondering, “How did you embed an interactive Google Map in this post?” WordPress “Support” is your friend: Support / Google Maps / Embedding a Google Map. 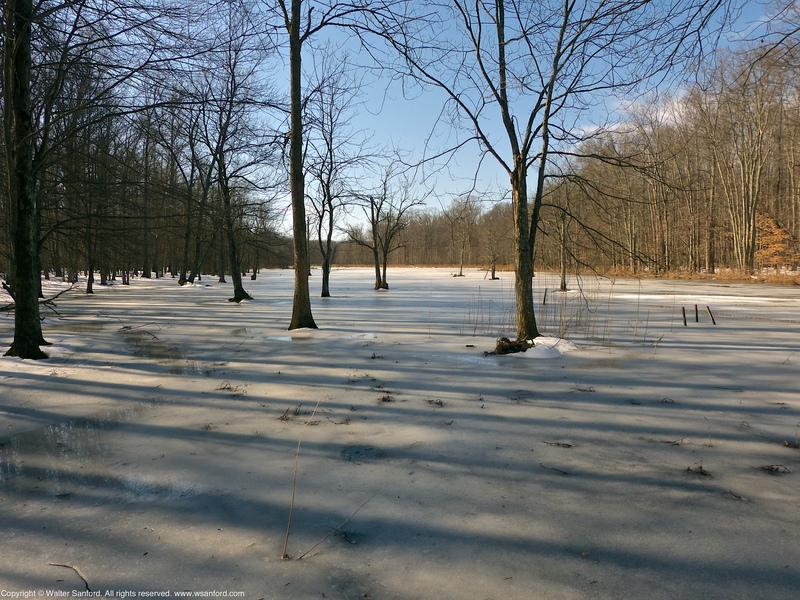 Tags:Huntley Meadows Park, Where's Waldo? Where’s Waldo? Please comment if you think you know my location. Tech Tips: I used my Panasonic Lumix DMC-FZ150 superzoom camera (superseded by the Panasonic Lumix DMC-FZ200 superzoom camera) to shoot the preceding photo. The camera was set for manual focus and aperture priority; the lens was focused at the hyperfocal distance for an aperture of f/4, based upon the instructions provided in the excellent video tutorial by Graham Houghton, “Panasonic Lumix FZ camera easier manual focus method — super point-and-shoot tip.” Focusing at the hyperfocal distance is a technique used in landscape photography that maximizes depth-of-field. For example, when my camera is set for maximum wide angle (4.5mm) at an aperture of f/4, everything is in focus from approximately three feet to infinity — that’s DEEP depth-of-field! Look closely at the full-size version of the photo. 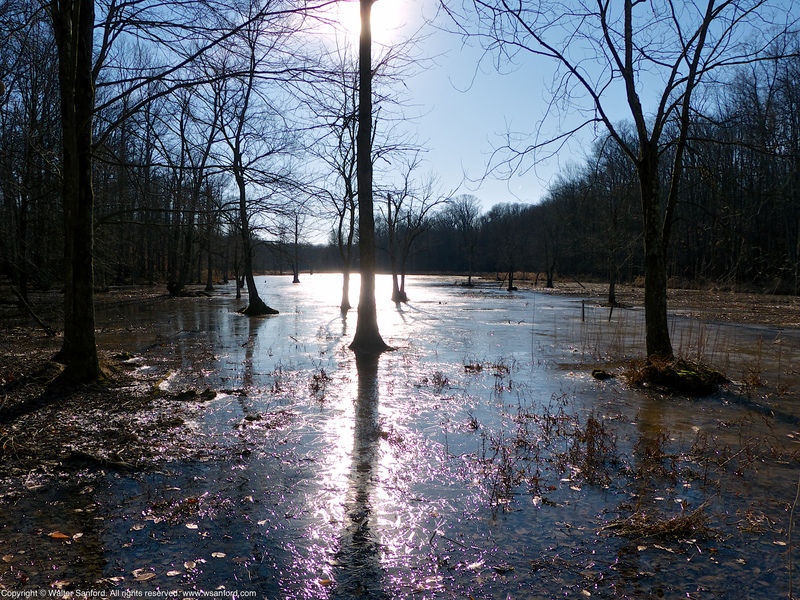 Notice the purple fringing that appears along the edges of some tree limbs (especially near the Sun) and along the ice (near the center of the foreground). Chromatic aberration is the technical name for color fringing that occurs sometimes in photographs of high contrast subjects such as the dark tree limbs against a bright sky. Adobe Lightroom features several photo editing tools that work well for removing chromatic aberration. If the image featured in this post were a fine-art landscape photo, then I would edit the image to remove the chromatic aberration. In this case, the photo is intended to show the view from one edge of the “Mystery Pool,” and it is good enough for that purpose, warts and all. Related Resource: The “Mystery Pool” during Winter 2016. Editor’s Notes: The location of the “Mystery Pool” will be revealed in a follow-up post. Mike Powell is not eligible to enter the contest since I told him where this photo was taken. Another insect ootheca was spotted at a vernal pool located near the terminus of the Hike-Bike Trail, Huntley Meadows Park. 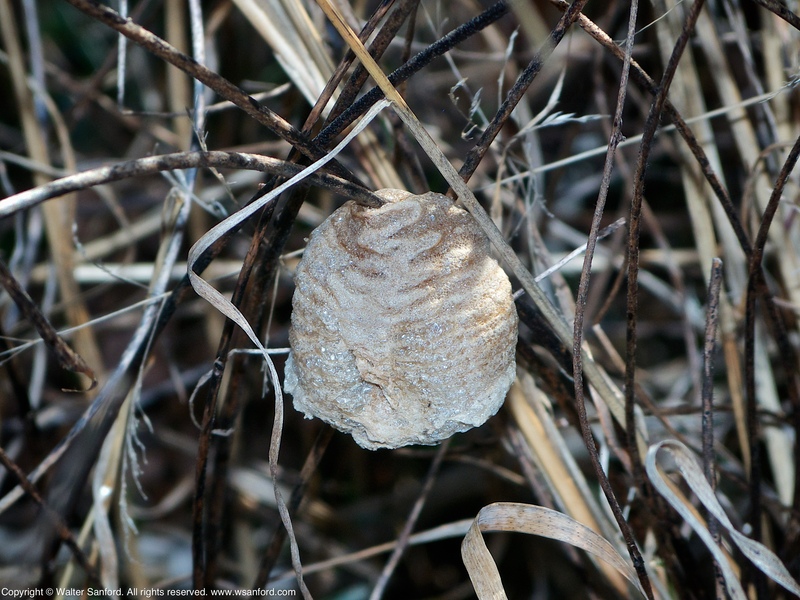 This is a Chinese Mantis (Tenodera sinensis) egg case, as indicated by the distinctive roundish shape of the ootheca. Chinese Mantis is a non-native species. 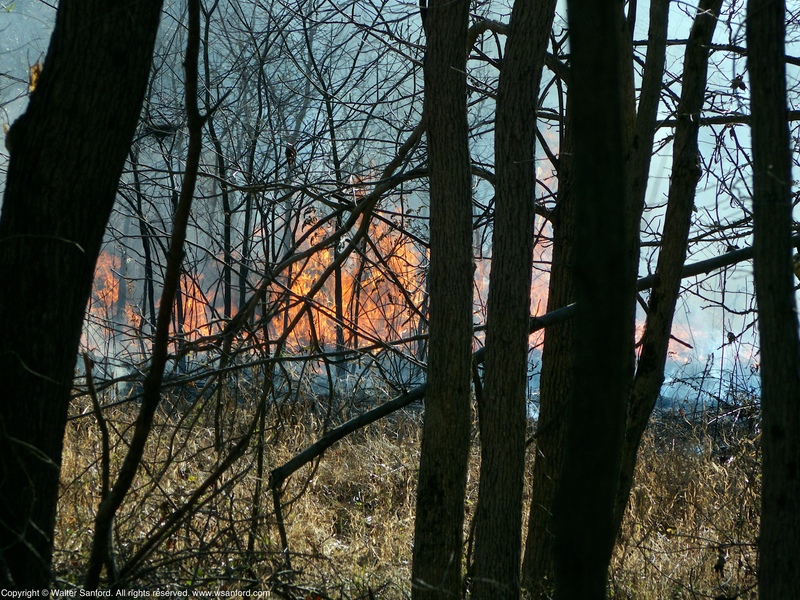 The Backstory: It was my good fortune to observe a controlled burn at Huntley Meadows Park on 14 January 2016. One of the target fields is located near the “accidental vernal pool,” my nickname for one of several vernal pools at the end of the Hike-Bike Trail. 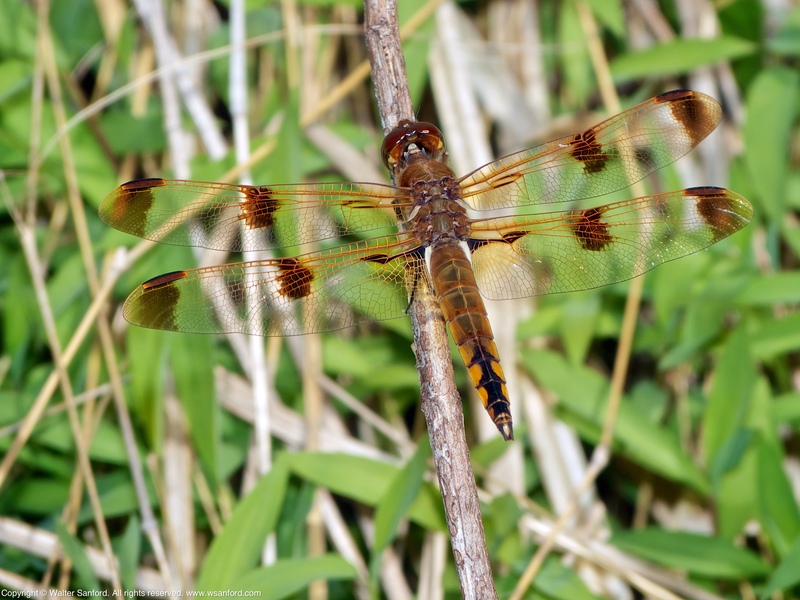 While I was in the neighborhood, I decided to look around for Autumn Meadowhawks in the hope of extending the state record late-date for dragonflies. Although I didn’t see any dragonflies, I spotted another Chinese Mantis egg case located near two other oothecae observed on 03 January. Talk about being in the right place at the right time! While photowalking unexplored trails at Huntley Meadows Park, it was my good fortune to observe a controlled burn. 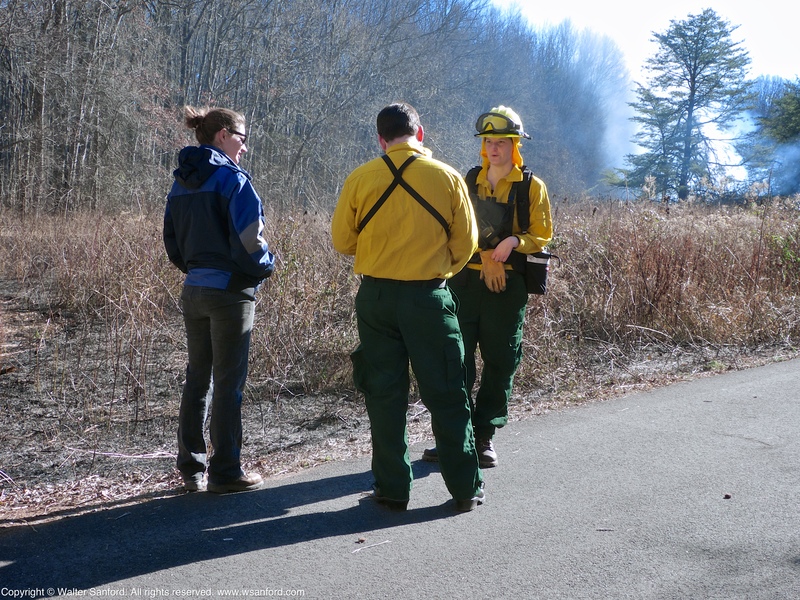 What is a controlled burn? Controlled burning is any fire intentionally ignited to meet specific land management objectives, such as to reduce flammable fuels, restore ecosystem health, recycle nutrients, or prepare an area for new trees or vegetation. Controlled burning is a management tool that when used under specifically controlled conditions will help land stewards manage forests and rangelands for multiple use. Source Credit: Controlled Burning, United States Department of Agriculture, Forest Service. The meadow shown in the following photo is located near the beginning of the Hike-Bike Trail. The next meadow is located near the terminus of the Hike-Bike Trail, on the right side of the trail (heading outbound). The last meadow is located at the terminus of the Hike-Bike Trail, on the left side of the trail just before the observation platform. 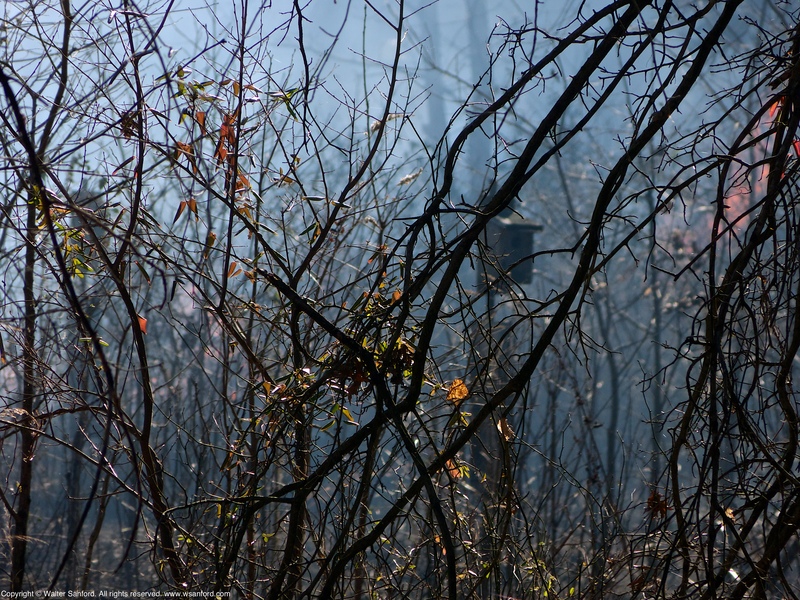 Related Resource: Capital Naturalist: Controlled Meadow Burn (2:11), by Alonso Abugattas. 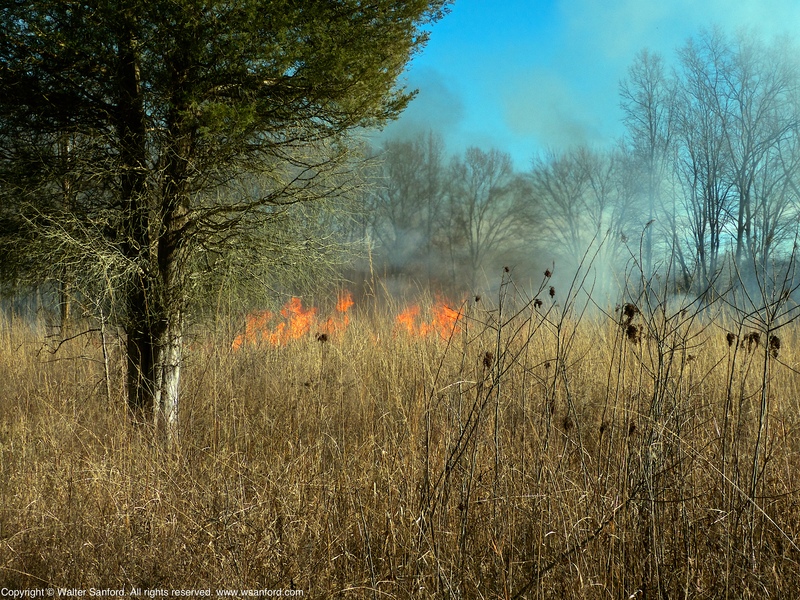 A controlled burn for meadow management in Northern Virginia [on 14 January 2016 at Huntley Meadows Park]. 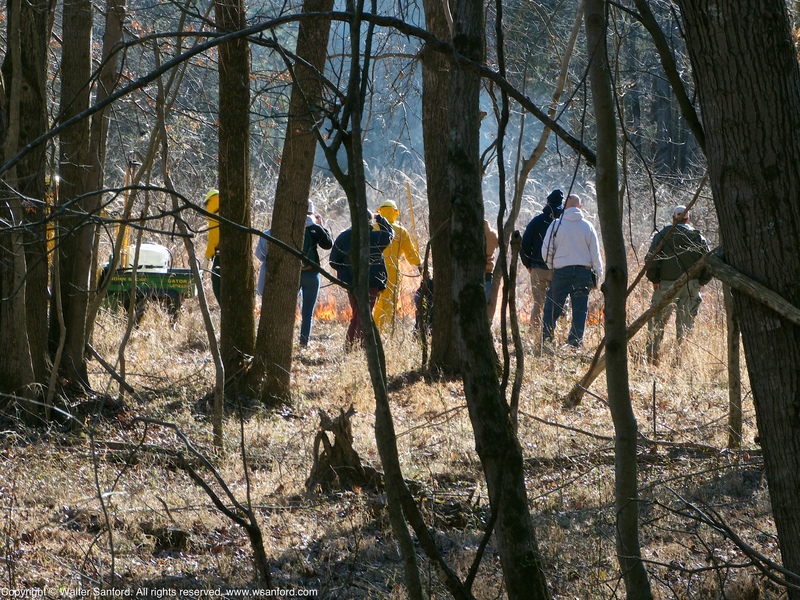 Controlled burns help suppress woody plants and kill invasives in keeping a meadow habitat. After checking the weather and and many other factors, a burn is done to kill off the emerging trees and invasives and keep the meadow open and valuable as a habitat. Source Credit: Video descriptor, by Alonso Abugattas, Natural Resources Manager, Arlington County Parks, Virginia. 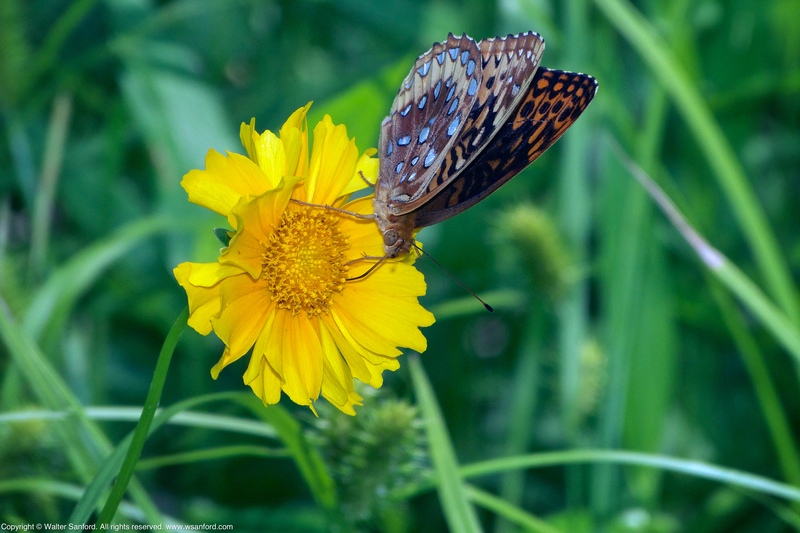 The first two photos in this gallery show a Great Spangled Fritillary butterfly (Speyeria cybele) nectaring on Large-flower Tickseed (Coreopsis grandiflora). 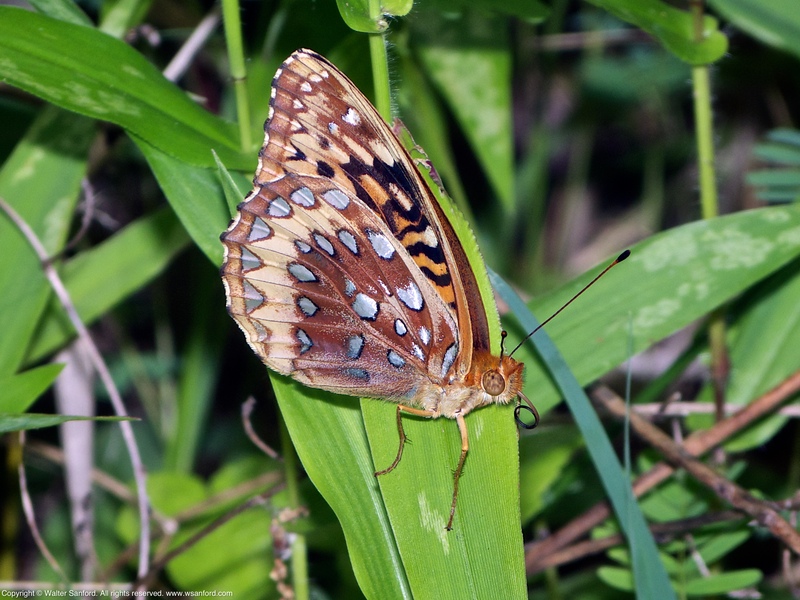 This butterfly was spotted in a small meadow near a vernal pool in the forest at Huntley Meadows Park. 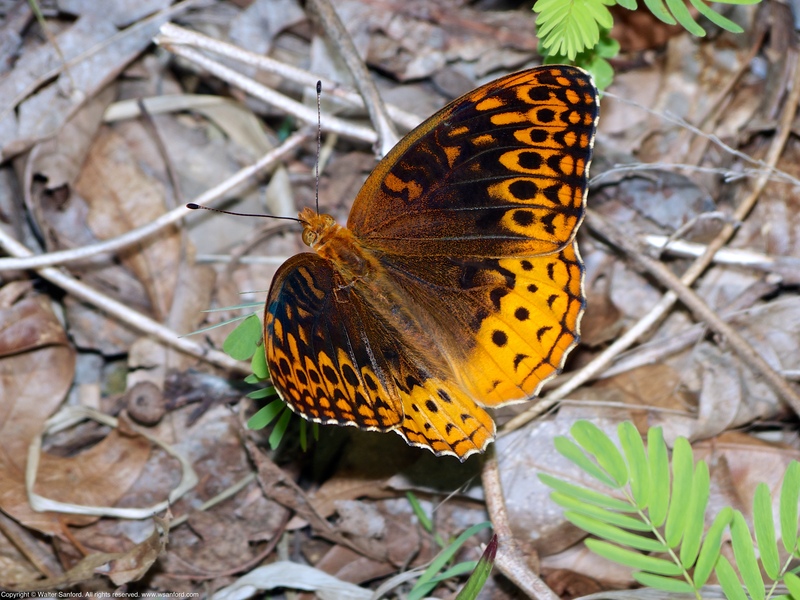 The wings of Great Spangled Fritillary are equally beautiful in either ventral view (shown above) or dorsal view (shown below). Editor’s Note: Thanks to Matt Ryan, Naturalist at Huntley Meadows Park, for identifying the yellow flowering plant shown in this gallery. 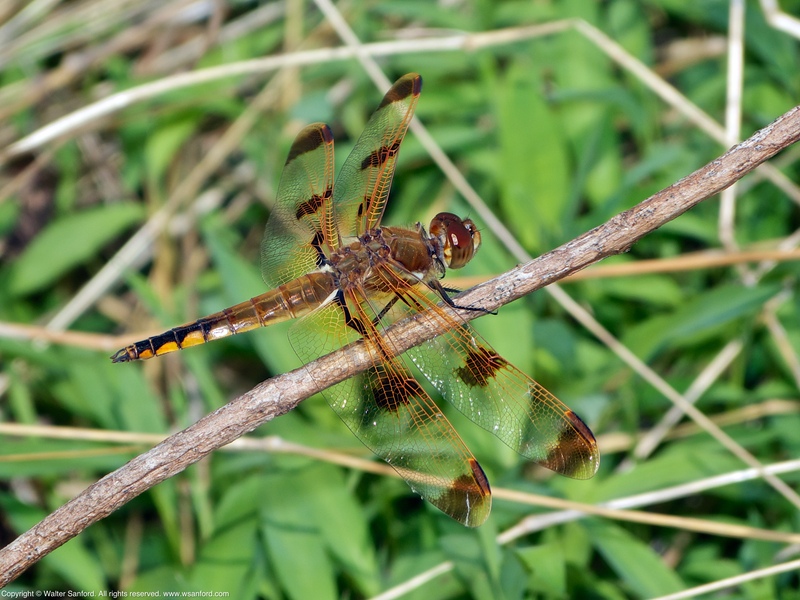 Continuing with the theme of colorful dragonflies that began in my last post, this photo gallery showcases the last Blue-faced Meadowhawk dragonfly (Sympetrum ambiguum) spotted during Fall 2015. This individual is a male, as indicated by his coloration and terminal appendages. 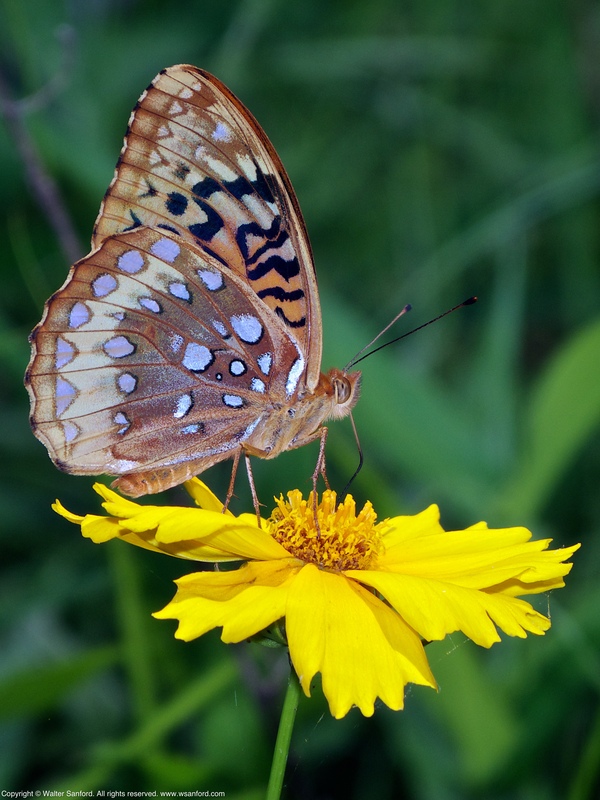 Males feature an unusual palette of colors that just seems to work! I followed this guy to several places around a small meadow near a vernal pool located in the forest at Huntley Meadows Park. 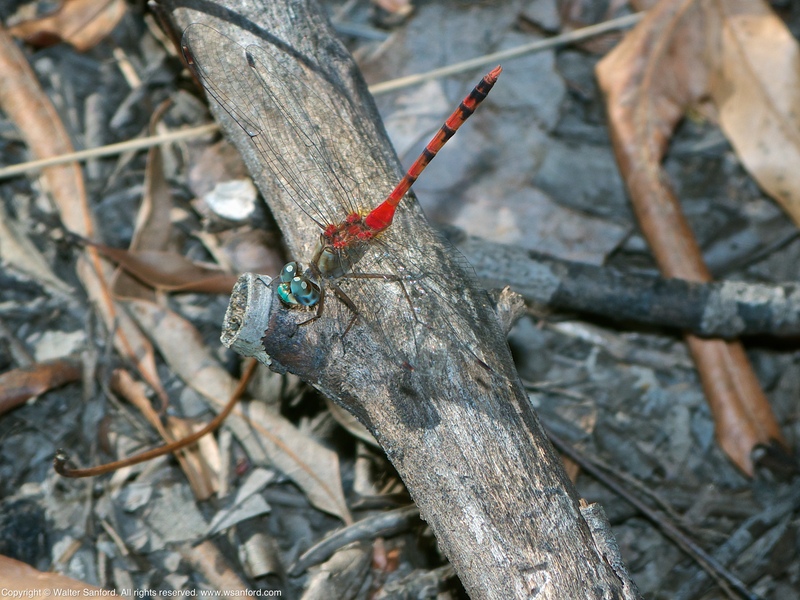 Blue-faced Meadowhawks are habitat specialists: they are always found near water in a forested location; the type of water body seems less important than its proximity to a forest. For this reason, I contend that Autumn Meadowhawks are an arboreal species of dragonfly. 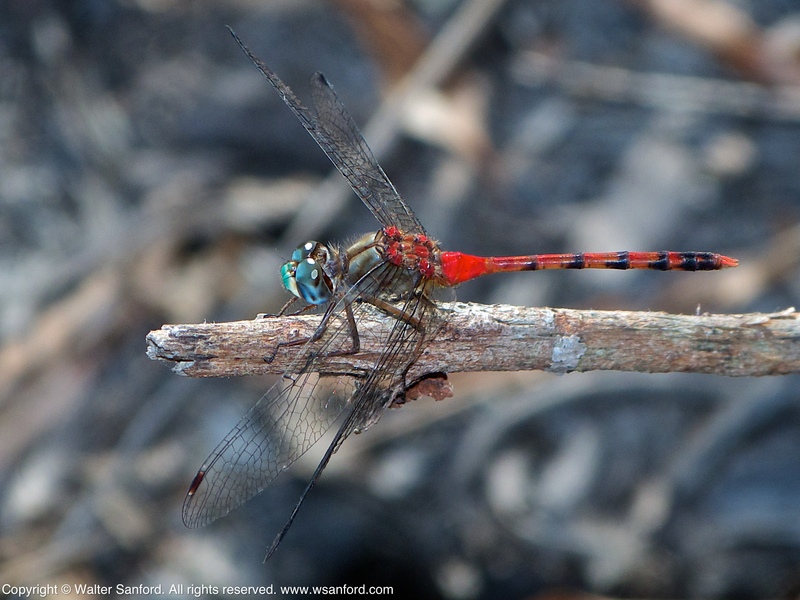 Almost nothing lifts my spirits on a cold winter day quite as much as looking at photos of colorful dragonflies! Like this Painted Skimmer dragonfly (Libellula semifasciata), spotted perching in a meadow alongside Barnyard Run, Huntley Meadows Park. This individual is a male, as indicated by his terminal appendages. 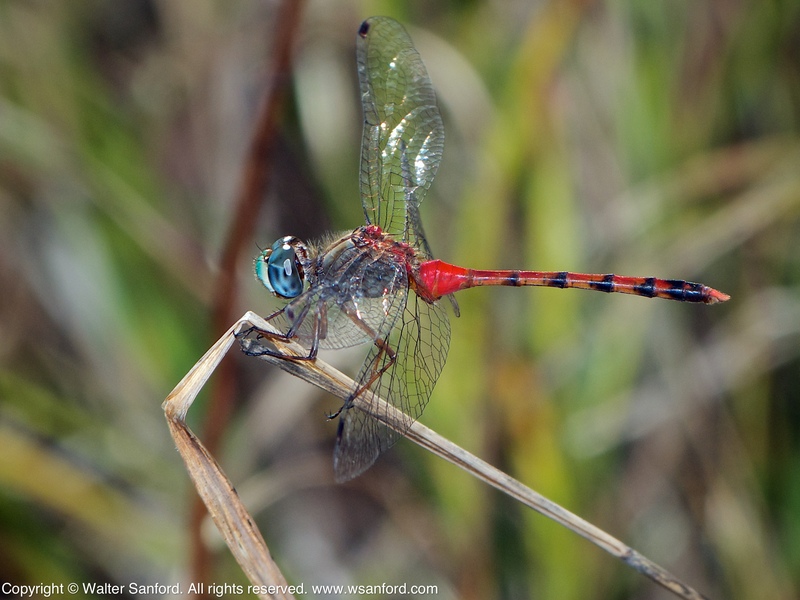 For those species of dragonflies that do not display sexual dimorphism, such as Painted Skimmer, males and females are nearly identical in appearance except for their terminal appendages. You are currently browsing the walter sanford's photoblog blog archives for January, 2016.